What sort of Almaty Places interest you? We all have our own tastes. Some like luxurious places, some enjoy outdoors, some like visiting any types of places as long as they can explore the real lifestyle of people living in the country they visit. 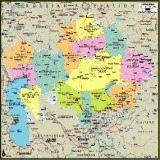 This page has all sorts of places in and around Almaty which are popular for one reason or another. Most Almaty places are "visitable" any time of the year depending on the level of your passion for adventure. Almaty is quite a compact city when it comes to places of interest. So as long as you have Your Almaty City Center Map with you, you should be fine. Here are some of these places in no particular order. These places are grouped together to make it easy for you to visit them in one go. They are either next to each other or not too far from. The Central State Museum of Kazakhstan, Republican Square and the Almaty Residence of the President of Kazakhstan (you can only enjoy a few meters away from the fence), Almaty City Administration, the former House of Government when Almaty was still the capital of Kazakhstan. If you need any shopping done while you are there Ramstore Supermarket is right next door. Kasteyev Art Gallery, across from the Rahat Palace hotel is quite a rich area for place to see and visit. Almaty Circus with the Fantasy World Theme Park next door. Auezov Kazakh Drama Theatre. Want to get you shopping done. No problems. Promenade Superstore is between the Central Stadium and the Central Sports Center. Abay Opera and Ballet Theatre is a must-go. It's across from the Hotel Almaty. Lermontov Russian Drama Theatre, across from it is the former Pushkinka, the nick name for today's National Library of RK with over five million books in over 100 language. Gorky Park is a great day out for the kids and adults. Apart from various rides there is also an aqua park and a zoo, so it should take your whole day by the time you try all and take photos. Botanical garden is a nice time out with various types of plants and trees. The deeper you go inside the garden, you don't even feel you are in the middle of the city. No noise, just you and the nature. I need to mention that the garden has been less fortunate during the difficult times of the country. The Main Exhibition Center Atameken is next door. Apart from various international exhibitions to attend, Atameken is a popular place among many locals to enjoy the walkways. Chimbulak and Medeo are places for winter activities like skiing and skating, they are really nice places to escape in summer to cool yourself down. People are up to all sorts of activities there as well as in and around the Big Almaty Lake. You can go trekking, horse riding, mountain biking, gathering herbs, going for picnicking. Some people manage to plunge into the cold water coming down from Glaciers. Brrr. And all this is within the 25 km radius from the city center. However, if you are time limited, I would choose Medeu direction or even Koktobe, which is 10 minutes from the Hotel Kazakhstan. Throughout this Guide I keep referring to the Hotel Kazakhstan when I want to explain directions. Why you would ask. Well, it's the popular place of interest in and around with many other Almaty places around like the Republican Palace, or Arman Cinema Theatre. It's also one of the main connection bus stops with buses going to most parts of the city. And Hotel Kazakhstan been the tallest landmark in Almaty seen from most parts of the city. To see the following places You'll need at least one full day, as it takes a bit of driving, as well as offroading to get there. But they are worth it. Charyn Canyon - 200 km to the east from Almaty, you can also visit the ancient Ash Grove about 40 km from the canyon. About 60 km further from the Grove there are hot springs with good enough facilities to have warm to hot water (some over +50) swimming pools summer or winter. Lake Kaindy about 280 km, a bit further from Lake Kaindy are Kolsai Lakes. Singing Sand Dunes is a great place but not in winter. It is about 182 km from Almaty. These places as well as any other places outside Almaty are picnic friendly. Don't forget to get your Shashlyk marinated long before the journey and have your drinks bought. Don't forget to clean the place after you. Hope these will keep you occupied for a while. And don't feel limited to these Almaty places, as there are so many other places to go as well, that we shall be covering as we go. Please keep in touch and let us know if you found a pearl in the steppe ;). Have A Great Place to Add? Help and be helped. Share your own Almaty Places!